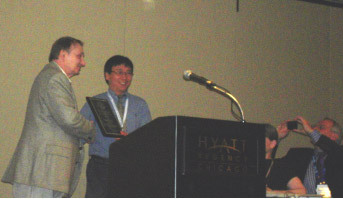 July 20, 2009 San Diego: Dr. Chong Yuan, Managing Director of Diazyme Laboratories Division, General Atomics, received the 2009 Pacific Biometrics Research Foundation Award at the annual meeting of American Association for Clinical Chemistry (AACC) held in Chicago on July 20th, 2009. The Award was presented to Dr. Yuan by Dr. George Casko, Chairman of Lipoprotein and Vascular Disease Division, in recognition of Dr. Yuan’s outstanding contribution to scientific research in clinical chemistry and his innovation in developing an enzyme cycling based clinical diagnostic test for blood levels of Homocysteine (Hcy), an emerging independent risk factor for cardiovascular disease and stroke. “Recent clinical studies showed that the risk for stroke increases 14 fold for patients with both high blood pressure and high blood Hcy in comparison with patients without either of them, and an accurate and easy to use Hcy test will play a key role in stroke prevention, especially for those of hypertension” said Dr. Yuan. For more information about Stroke and Hcy, please click this link. Details about enzyme cycling and Hcy test can be found online at www.diazyme.com. Dr. Yuan received his Ph.D. from Kyushu University, Japan, specializing in enzymology, and co-founded Diazyme Laboratories in 2000, focusing on research and development of enzyme based novel clinical diagnostic reagents and their commercialization.